Of course West ham have a proud tradition of producing top quality homespun talent from the much envied academy, but we have also been privileged to house some pretty exotic foreign talent. While there have been some spectacularly disastrous signings, we have certainly gotten much excitement from the arrival of unknown quantities and in many cases found players who have not only absorbed our culture, but even added to the whole concept of what it is to wear the Claret and Blue. These palyers have arrived in dribs and drabs over the years – but what if they could all suddenly morph into a simultaneous phenomenon – making up the Johnny Foreigner XI? Goalie: surely no debate here. Ludo. Can we ever forget the excitement? He always seemed on the verge of a mistake, but actually very rarely slipped up and was an unrivalled shot stopper. Defence: Centre backs Marc Rieper and Slaven Bilic. Brave, physical, streetsmart and Bilic was quick enough when he needed to be. Also, think of the opposition panic at our set pieces? Right back – lots of above average contributions – but its got to be the terrifying Tomas Repka. I know he could be error prone but his commitment was unequalled. Remember those tears when we got relegated? Left back..Hmmm. I found this the most difficult to fill and after much consideration selected Herita Illunga (mostly based upon his first season at the club!). Midfield has so many choices. Central midfield Eyal Berkovic and Mark Vivien Foe. Right sided midfield: Yossi Benayoun. Let’s all hope he adds to the justification during his renewed spell at the club. Left sided: Paulo Futre – not because he contributed much on the field during his nine appearances (let’s face it he was crocked before he arrived) but because he made us feel special to have such a legend amongst our ranks at a time when morale was low. Forwards: Carlos T and Di Canio. 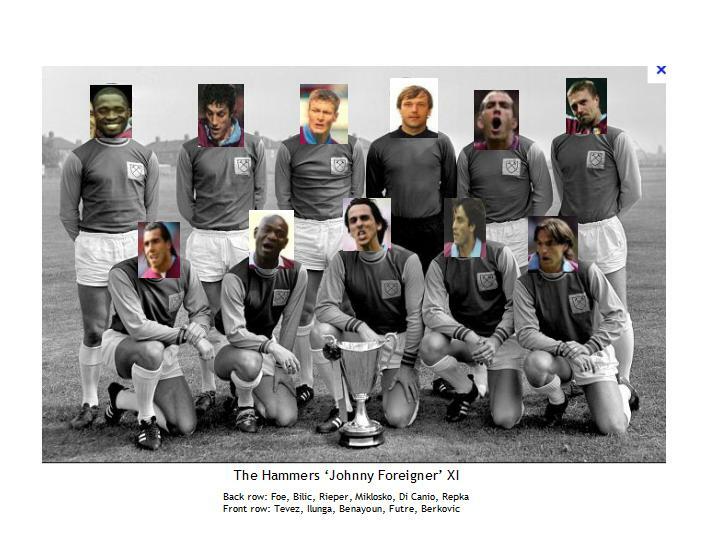 All time Hammers’ legends. No debate here. These players have been largely selected according to their individual merits rather than complementary skills within a team. Would Futre pass the ball to Di Canio? Would both Benayoun and Berkovic be too lightweight in midfield? Would the award of a penalty provoke endless ball wrestling as to who would get the honour? Delicious Photo. Ilunga looks hilarious! LOST "one piebald pony, ates nothing but she does the ton"